The Diamond & Pearls Mother's Bracelet I ordered for my daughter after the birth of her second daughter is beautiful! 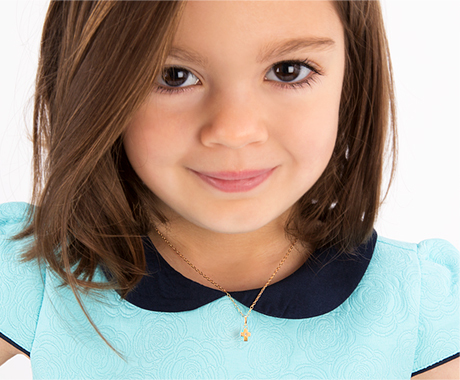 She is so proud to wear it and show off the names of her little girls with their birthstones. Tiny Blessings always has prompt delivery and always comes packaged in a beautiful presentation box. I have ordered at least 6 different gifts from them and have never been disappointed in their products! I will definitely order gifts from them in the future. This was the gift chosen for a special lady, ou daughter’s kindergarten teacher! My daughter loves her and this bracelet is perfect to cherish that bond! It has the teacher’ s name on it and a beautiful charm that we have added with our daughter’s name. I’m sure she will be delighted with this gift! It is really beautiful! The pearls and diamonds gives it that extra sparkle! I love it so much, I will buy one to myself also! And the package was elegant and perfect for a gift!! I bought this Mother's bracelet for my daughter, it is just lovely.... would recommend this company highly! I received this bracelet and it is absolutely beautiful! It fits me really well and it looks well made. Always impressed and delighted, as a returning customer, to Tiny Blessings. Couldn't be happier. Big smile of reward! I ordered this for a mother of two girls. All three names fit and the look was very nice. The quality of work is very nice from Tiny blessings as is their overall design aesthetic. I only gave 4 stars to the baby version, Not sure why, probably because it is smaller and has less impact than this woman's bracelet. The bracelet I purchased was given to a special neice on her 25th birthday. She was pregnant and the bracelet has her son's name on it. It has served as inspiration for her as she was carrying her child and a constant reminder of her love for her son then and now. The quality is top notch. The packaging is beautiful! The craftmanship is outstanding. It is just the gift I wanted to give and I know it will be enjoyed by my neice for many years to come. Not only was she thrilled when she received it, she thanked me again just last week for such an awesome gift that she treasures and how very nice it is. After placing and paying for my order, a situation surfaced that prompted me to cancel my order and request a refund. I was treated with respect and a prompt refund was remitted without delay. Several days later my situation changed again and based on my previous interaction, I decided to re-place the order. My gift was for a very close friend and upon receipt she was delighted with my gift and thanked me for the gift as well as for introducing her to Tiny Blessings. At some point in the future, her two daughters will most likely be wearing jewelry from Tiny Blessings. These braclets are just BEAUTIFUL the quality is just excellent , I have brought several . I got this for my daughter for her first born child. She absolutley loves it and wears it all the time. People are always complimenting her on it and asking her where she got it! I bought this bracelet for my grand daughter with her birthstone and other charms. She absolutely loves it and so do I. The quality and craftsmanship is beautiful and worth any amount of money you spend! I am so happy I found this website and will continue to purchase gifts. My daughter has given us two beautiful grandchildren so I wanted to thank her with this beautiful bracelet. She loved that it had their names and birthstones along with the Swarovski crystals and pearls. It is absolutely gorgeous!! This is my second purchase from Tiny Blessings and I am positive that I will be ordering again and again! Grandma wants a beautiful bracelet too! I bought this bracelet for my sister, she is grandmother to three boys. She loves it!! It is a beatiful bracelet with the boys birthstones, the pearls are beautiful. The picture does not do the bracelet justice!! It is delicate and will look great for any occasion. I purchased this for my boyfriend's mother. Her two sons and her granddaughter are the most precious gifts in her life. I wanted to get her something that really encompassed how precious they are. She adored this bracelet! It is even more beautiful than the picture can relay. It is an amazing bracelet! I purchased this bracelet for my daughter-in-law who is expecting our first grandchild. She loves it! It's absolutely beautiful! My Granddaughter loves her bracelet, and we all feel safe as it is well made and child safe. I will order more for all my Grand children in Australia. I received my first Tiny Blessings bracelet as a gift when my first daughter was born. It's been my favorite gift! I have since ordered several for friends with new babies. It's beautiful, sentimental and made of great quality!